Walking out coats and rain macs . . . If your dog is 'sitting in between sizes': we would recommend that you opt for the smaller size rather than the larger one. A coat that is too big can slip round and please consider the positioning of the Velcro strap and the boys . . . The coats are listed under sizes and we have included the exact measurements for the coat with the hood/ collar worn turned-down (see left below) and for the hood/ collar worn turned-up (see right below) to the end of the coat. Knitted dog coats . 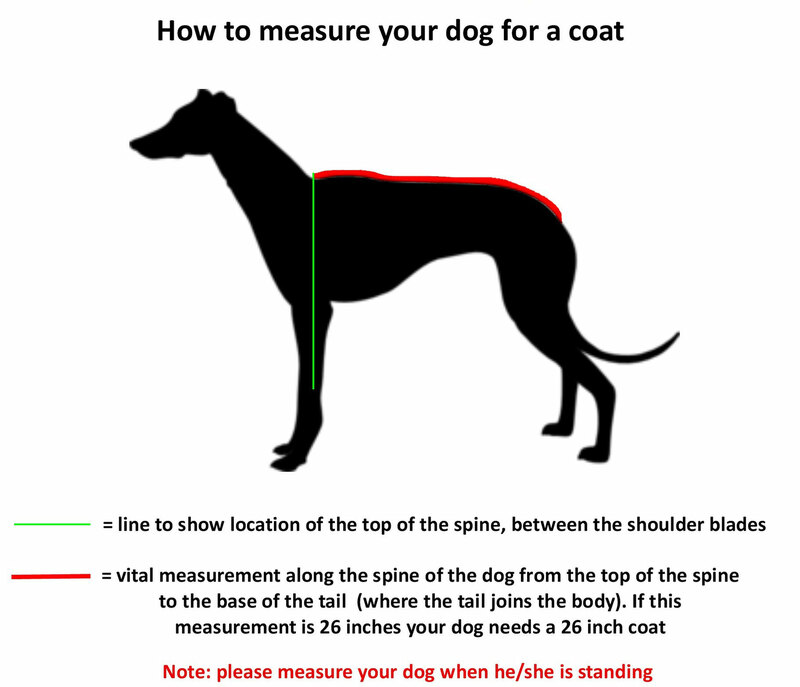 . .
With regards to the sizing of knitted dog coats our advice is to buy bigger than your dog's actual measurements. We measure the coats (measured flat) from the base of the neck to the end of the coat, but we can't factor in the girth of your dog. Example: Lily here measures 28 inches from the base of her neck to the top of her tail and is a larger (sorry Lily - longer) than average greyhound lady. She's very reluctantly modelling a knitted dog coat that measures 38 inches when it's laid flat. This coat is a little too long for Lily, it could do with being about 3 inches shorter, but she needs a coat that covers her bottom and won't keep riding up - so buy big with the knitted dog coats. Very often a sighthound's neck is larger than its head and some people prefer to use a martingale collar rather than a buckle collar. Here at the Erin Hounds shop we have no preference and offer both leather fishtail collars and martingales. What we can't emphasise enough is that they are fitted correctly . . . These should be fitted on your dog directly behind the ears at the top of the neck and be a good, snug fit. 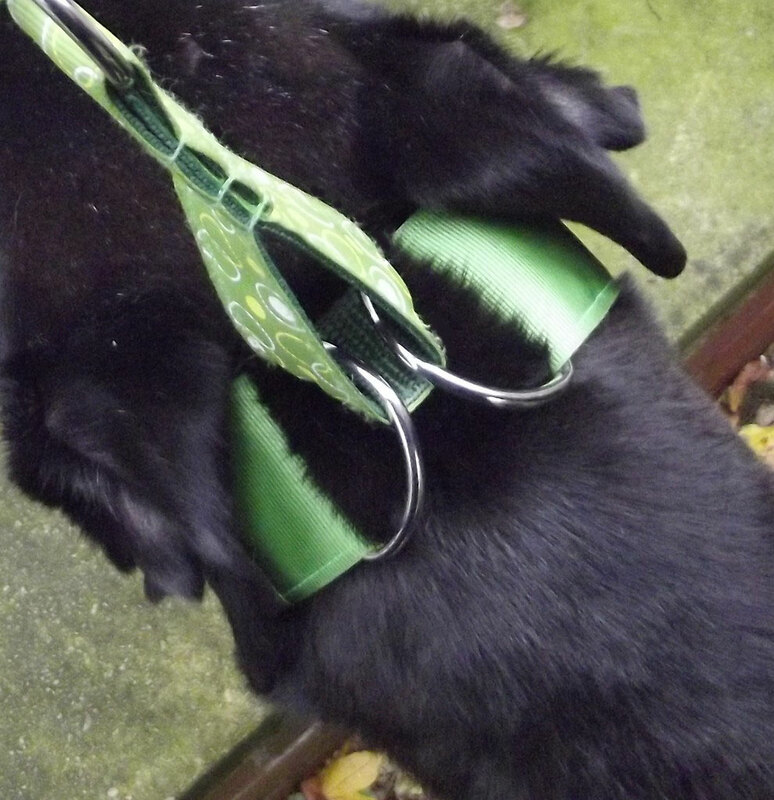 A properly fitted martingale should be comfortably loose when the dog is stationary. When the martingale is pulled the two slides (D rings or reducing slides) should pull close together, but should never touch. Due to the long, delicate nature of sighthound necks these collars are recommended for use as a house or tag collar only. We advise that sighthounds are not walked on them, but they are ideal for attaching your dog's ID tag to and for permanent wear in the house and garden. One advantage of your hound's long, beautiful neck is that, when you do take them out, there's room for a martingale or leather collar as well as their house/ tag collar. With the single loop design house/ tag collars please ensure the label inside is against your dog's neck fur for the correct fitting. We recommend that you regularly check your dog's collar and lead for signs of wear and tear. All Exclusive @ Erin knitted goods will come with care instructions on how to keep your items looking as fresh as possible. As with any knitted items we recommend that you either handwash them or put them in your washing machine on a 'delicates' cycle (30 degrees) and do not tumble dry them, but allow them to dry flat. We've aim to be as accurate as possible with measurements and try to ensure that all the knitted coats especially have accompanying photographs of a hound wearing them so you can get a better idea of the fit. If you need additional information e.g width of neckline, depth of chest panel etc. - please don't hesitate to contact us. It doesn't take long to get a tape measure out and we're here to help! We aim to process and ship your order as quickly as possible and usually get most items posted within five working days. At peak times there may be a slight delay, but customers will be notified of this on the Erin Shop if this is the case. All goods will be posted using First Class Royal Mail delivery with the possible exception of any parcels / packets containing Christmas Cards. These orders may be dispatched using Royal Mail Second Class services if the Royal Mail First Class P & P charges exceed the actual P&P paid. please contact us before you place an order and we can invoice you direct for your goods and advise of appropriate postal charges. Helping others . . . Here at Erin Hounds we are entirely volunteer run and appreciate how every penny counts! 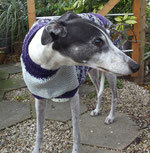 We have sent knitted coats and snoods to other dog rehoming charities for their dogs in kennels. Below is a gallery of a few photographs sent to us from Greyhounds in Need of their dogs wearing knitted coats. We also occasionally receive smaller items that lurchers and greyhounds are just too big to fit in to. If you're involved with a charity and you think we can help please drop a line to: erinhounds@gmail.com and we'll see what we can do.